Looking for shoulder exercises that are easy to implement or that can be done at home, then this e-book is for you! Shoulder girdle exercises can increase shoulder stability, which is an essential base for good handwriting. Many children who struggle with pencil control and whose fine motor skills are poor, lack good stability and control of shoulder girdle muscles. 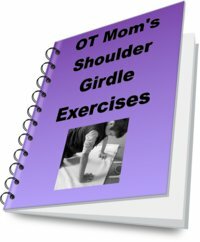 Includes: 3 pages of information on shoulder stability; Shoulder Girdle Exercises with 14 pages of photographed activities; 4 page Exercise Planner: essential to successfully implementing the activities at home. Shoulder Exercises with a Therapy Ball; Shoulder Exercises you can do at the park or playground. * As with all E-Books, payment is required before they can be downloaded. Please see the main E-book page for simple ordering information or hit "Buy Now" to purchase this title immediately. Then use your BACK button to return here.